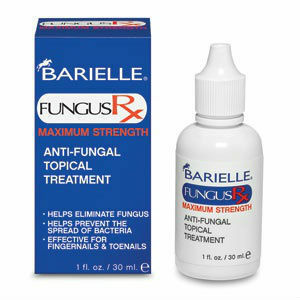 Barielle prescription strength nail fungus treatment is used to eliminate nail fungus and bacteria. Barielle Nail Fungus RX contains maximum strength ingredients to fight bacteria, fungi and viruses. Treats nail fungus infections on cuticle, and nail edges. The only ingredient listed in the product source is Tolnaftate which is identified as a tropical fungal treatment. Nothing is said about the strength or amount provided of this ingredient. Nothing is said in the product source about product dosage or application. The product comes in a small 1 fluid once container (bottle). $18.00 for a 1 fluid once container. The product source contains no information about product warranties or returns. The source however does include a number purchasers can call with questions. The product source does not contain any product reviews from users. This product is not inexpensive at $18.00 for a 1 fluid once container. Given that it would make sense to take advantage of the vendor number provided in the product source to find out more about product application and strength along with information about product customer reviews, guarantees and return policies. Jack Stevens	reviewed Barielle	on November 25th	 and gave it a rating of 3.5.